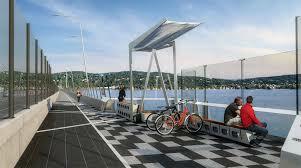 The state has released an animation depicting the future walking and biking path across the Gov. Mario M. Cuomo Bridge.The 1 minute, 25 second, long animation shows the future path, plus the six themed overlooks where cyclists and pedestrians can rest. I must admit I was a fan of the old Tappan Zee Bridge, but have really grown to admire the design of the new Mario Cuomo Bridge if not the name. It is also exciting that pedestrians and cyclists will be able to cross from both Nyack side or the Taytown side to enjoy both of these wonderful villages. As a Nyack real estate agent I am seeing this pedestrian crossing as a boon to stores and restaurants in Nyack as well as Tarytown. Really excited to strolling over the majestic Hudson River with friends and family. See the animation by clicking link below.